This article outlines how to use the Copy Activity in Azure Data Factory to copy data from an SAP Business Warehouse (BW) via Open Hub. It builds on the copy activity overview article that presents a general overview of copy activity. You can copy data from SAP Business Warehouse via Open Hub to any supported sink data store. For a list of data stores that are supported as sources/sinks by the copy activity, see the Supported data stores table. SAP Business Warehouse version 7.01 or higher (in a recent SAP Support Package Stack released after the year 2015). Copying data via Open Hub Destination local table which underneath can be DSO, InfoCube, MultiProvider, DataSource, etc. Copying data using basic authentication. SAP BW Open Hub Service is an efficient way to extract data from SAP BW. The following diagram shows one of the typical flows customers have in their SAP system, in which case data flows from SAP ECC -> PSA -> DSO -> Cube. SAP BW Open Hub Destination (OHD) defines the target to which the SAP data is relayed. Any objects supported by SAP Data Transfer Process (DTP) can be used as open hub data sources, for example, DSO, InfoCube, DataSource, etc. Open Hub Destination type - where the relayed data is stored - can be database tables (local or remote) and flat files. This SAP BW Open Hub connector support copying data from OHD local table in BW. In case you are using other types, you can directly connect to the database or file system using other connectors. ADF SAP BW Open Hub Connector offers two optional properties: excludeLastRequest and baseRequestId which can be used to handle delta load from Open Hub. excludeLastRequestId: Whether to exclude the records of the last request. Default value is true. baseRequestId: The ID of request for delta loading. Once it is set, only data with requestId larger than the value of this property will be retrieved. In the first step, a DTP is executed. Each execution creates a new SAP request ID. The request ID is stored in the Open Hub table and is then used by the ADF connector to identify the delta. The two steps run asynchronously: the DTP is triggered by SAP, and the ADF data copy is triggered through ADF. By default, ADF is not reading the latest delta from the Open Hub table (option "exclude last request" is true). Hereby, the data in ADF is not 100% up-to-date with the data in the Open Hub table (the last delta is missing). In return, this procedure ensures that no rows get lost caused by the asynchronous extraction. It works fine even when ADF is reading the Open Hub table while the DTP is still writing into the same table. You typically store the max copied request ID in the last run by ADF in a staging data store (such as Azure Blob in above diagram). Therefore, the same request is not read a second time by ADF in the subsequent run. Meanwhile, note the data is not automatically deleted from the Open Hub table. For proper delta handling it is not allowed to have request IDs from different DTPs in the same Open Hub table. Therefore, you must not create more than one DTP for each Open Hub Destination (OHD). When needing Full and Delta extraction from the same InfoProvider, you should create two OHDs for the same InfoProvider. Set up a Self-hosted Integration Runtime with version 3.13 or above. See Self-hosted Integration Runtime article for details. Download the 64-bit SAP .NET Connector 3.0 from SAP's website, and install it on the Self-hosted IR machine. 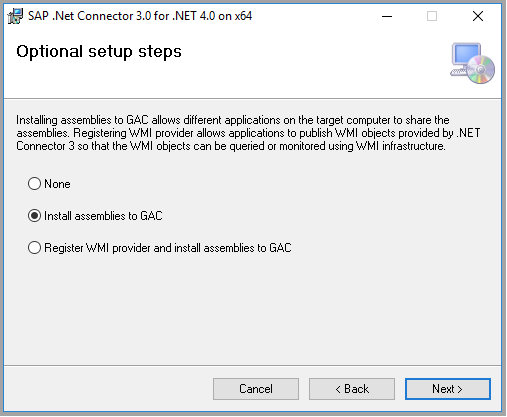 When installing, in the optional setup steps window, make sure you select the Install Assemblies to GAC option as shown in the following image. Authorization for RFC and SAP BW. Permissions to the “Execute” Activity of Authorization Object “S_SDSAUTH”. Create SAP Open Hub Destination type as Database Table with "Technical Key" option checked. It is also recommended to leave the Deleting Data from Table as unchecked although it is not required. Leverage the DTP (directly execute or integrate into existing process chain) to land data from source object (such as cube) you have chosen to the open hub destination table. For a walkthrough of using SAP BW Open Hub connector, see Load data from SAP Business Warehouse (BW) by using Azure Data Factory. The following sections provide details about properties that are used to define Data Factory entities specific to SAP Business Warehouse Open Hub connector. systemNumber System number of the SAP BW system. clientId Client ID of the client in the SAP W system. "value": "<Password for SAP user>"
For a full list of sections and properties available for defining datasets, see the Datasets article. This section provides a list of properties supported by the Salesforce dataset. To copy data from and to SAP BW Open Hub, set the type property of the dataset to SapOpenHubTable. The following properties are supported. If your Open Hub table only contains the data generated by single request ID, for example, you always do full load and overwrite the existing data in the table, or you only run the DTP once for test, remember to uncheck the "excludeLastRequest" option in order to copy the data out. "openHubDestinationName": "<open hub destination name>"
For a full list of sections and properties available for defining activities, see the Pipelines article. This section provides a list of properties supported by SAP BW Open Hub source. To copy data from SAP BW Open Hub, set the source type in the copy activity to SapOpenHubSource. While there are no additional type-specific properties needed in the copy activity source section. When copying data from SAP BW Open Hub, the following mappings are used from SAP BW data types to Azure Data Factory interim data types. See Schema and data type mappings to learn about how copy activity maps the source schema and data type to the sink.